Nigerian Banga Soup or Ofe Akwu is native to the Niger Delta and the South Eastern parts of Nigeria. In the Niger Delta areas, Banga soup is commonly eaten with various fufu recipes: Starch, Pounded Yam, Semolina, Garri and Cassava Fufu. In the South Eastern parts of Nigeria, Banga Soup is referred to as Ofe Akwu where Ofe means Soup / Stew and Akwu means palm fruit and is used mainly as stew for Boiled White Rice. The palm fruit oil extract used in cooking Banga Soup / Stew is quite different from the red palm oil used in cooking Nigerian food recipes. 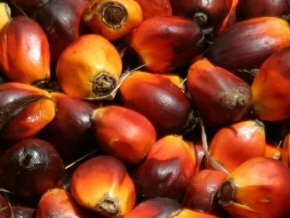 Palm Oil is pure oil extracted from the palm fruit pulp at high temperatures while the palm fruit oil extract used for the Banga Soup is extracted at a very low temperature and is a mixture of oil and water. Palm fruit oil extracted for Banga Soup contains less saturated fat than palm oils. Extract the palm fruit concentrate from the palm fruits. If using the tinned palm fruit concentrate, open the tin and set aside. Cook the beef and the dry fish with 1 bulb of diced onion and the stock cubes till done. Wash and cut the scent leaves into tiny pieces. 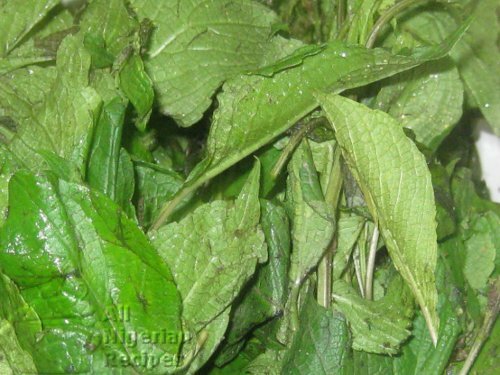 The scent leaves give the Banga Stew (Ofe Akwu) its unique aroma and taste. If you are outside Nigeria, this may be hard to find, so you can use pumpkin leaves or any other vegetable in place of scent leaves. 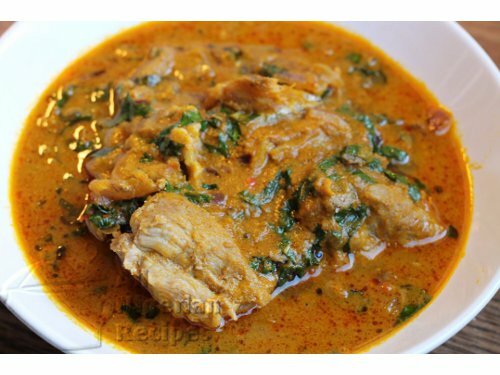 If cooking Delta-style Banga Soup for starch, you should either cook this soup without vegetables or use dried and crushed bitter leaves. Cut the remaining bulb of onion. Pound the crayfish, ogiri okpei and pepper in a mortar and set aside. You can also grind them with a dry mill. Set the pot of palm fruit extract on the stove and start cooking at high heat. Leave to boil till you notice come red oil at the surface of the Banga Stew. If you think that the Banga Soup is watery, cook till the soup has thickened to the consistency you like for your stews. Now, add the beef, dry fish and stock, the onions, crayfish and pepper and leave to boil very well. Add the scent leaves or other vegetable and salt to taste. Leave to simmer for about 2 mins. The Banga Soup is done. Serve with White Rice or use the Delta-style Banga Soup to eat Starch, Garri, Semolina, Amala or Pounded Yam. When the beef and fish are well done, add the palm fruit concentrate and add water to get the consistency you like for your stews. Leave to boil very well. Add the onions, crayfish, pepper and ogiri blend and let it boil very well. Add the scent leaves or other vegetable and salt to taste. Leave to simmer for about 2 mins. The Banga Soup is done. If you used bitter leaves to prepare it, serve with Nigerian fufu meals especially Starch. If you used scent leaves to prepare it, serve with boiled white rice.